Hi everyone and welcome to Simon Says Stamp April 2015 Card Kit Blog Hop! 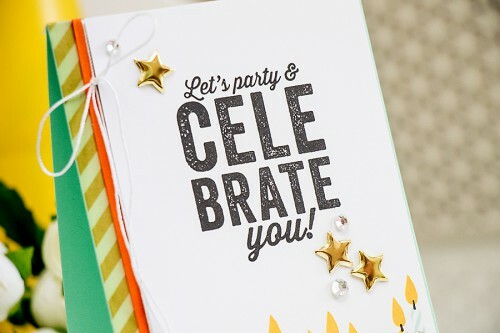 The colorful April Card Kit of the Month, CELEBRATE!, has begun shipping! The bright and cheerful kit is delightful for celebrating any occasion. You can subscribe to this (no obligation) fabulous card kit of the month program for just $24.95 plus shipping and handling. Kits can also be purchased individually at Simon Says Stamp store for $29.95 plus Shipping and Handling. Simon’s card kits are ALWAYS awesome! Subscribers can skip any month or unsubscribe at any time. Card Kits are revealed on the 14th of every month. May’s card kit will be revealed April 14th. Card Kits ship from the 17th through 27th of each month. May’s card kit will begin shipping April 17th. Yay! I am currently away on vacation somewhere in the Mediterranean, but I couldn’t miss out the opportunity to join this hop from Simon and share one more project using their April Card Kit. So here’s my project – I stamped the Lets Party & Celebrate You sentiment using black ink onto a panel of white cardstock which was trimmed to about 4 x 5 1/2 inches. Next I added a fun colorful border using candle image – I stamped it repeatedly using yellow, pink and mint. I mounted the panel onto an A2 top folding card base made out of mint cardstock, added a bit of washi tape and a thin strip of orange cardstock. Heather Ruwe – next stop! Please leave a comment here and other participating blogs for your chance to win Simon Says Stamp goody bag filled with fresh and exciting new products. The winners will be chosen on Wednesday, April 15. The winner of the giveaway is Ohhh Snap!. Congratulations! Simon Says Stamp will be in touch with you. Thank you everyone for the lovely comments! I’m so glad you liked this project. Love that the candles fall off the bottom. This blog hop is a good one. Totally love your card. Thanks for sharing! Love you card with all the fun candles! Wow love all the candles in the bottom and how you used the star brads. The candles make the card cute ans cheerful! Love your cards, such a versatile stamp set. Thanks for the inspiration. Hope you’re getting warm and sunny weather on your vacation! Such a fun card! I love the way you used so many candles (not enough for my birthday though unfortunately)! Very pretty colours and great gold accents. love this kit. Love the candle card. I’m seeing so many great ideas for the same stamp. Hope you’re having a fabulous vacation, Yana! 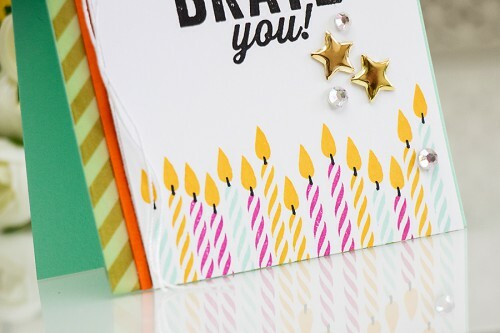 I love your bright and cheery colors with the fun candles bordering the bottom of your sweet card. 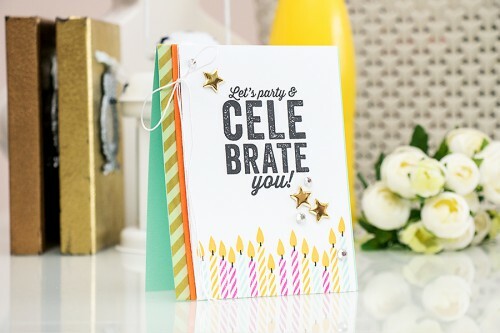 What a great card kit and fun blog hop! I love how you uses the kit to make such a cute card! Awesome! Cute card. I love the inspiration on this blog hop. All the great ideas to use the same supplies. This card is so appropriate for any age and both men and women; great colors and layout (candles along the bottom). So many great cards on the hop. This set will get so much use. OMG – love those candles!! All three cards are awesome!! Beautiful and fun card! Enjoy your vacation! I love all of those candles! Love the candles. Great idea. Such a great sentiment and a great card!! Gold accents looking soo pretty, tnx, Yana! Love your cards. So fun. Great card, love the gold stars and candles along the bottom!thank you! Thanks for the inspiration Yana. Loving this card kit! Great card! Have a nice holiday!